If you’re planning on installing a marine VHF radio on your vessel, you’re definitely going to want to install a durable, premium quality marine VHF antenna, too. Just like any other antenna (a CB antenna for a CB radio, for example), a marine VHF antenna helps to improves the transmission power of a marine VHF radio. Essentially, it serves as the device that connects your radio to the rest of the world by ensuring that the signal is distributed toward the correction direction. Without an antenna, the signals won’t be sent in the right direction, and your range will be virtually non-existent. With a high-quality antenna, the range of your VHF radio will be enhanced, the signals will be sent to the proper direction, and your transmissions will be a lot clearer. Plus, a high-quality antenna will be able to withstand the elements and any rough seas that you may be sailing. To learn more about each product, read through the following reviews. Once you decide on an option that you feel will best meet your needs, click on the yellow link to find the best prices currently available on Amazon. First up on our list of the best marine VHF antennas is an option that comes from Shakespeare, one of the most trusted names in the marine electronics industry. They offer a wide selection of products, including cellular amplifiers and Internet amplifiers, and of course, marine VHF amplifiers. Their 5226-XT 8’ Galaxy Antenna is considered their best marine VHF antenna, as it offers the highest amount of range and improves the clarity of reception and transmissions the best of all of their products. This marine VHF antenna is extremely strong and durable, which makes it super rugged for use on radar arches, T-tops hard tops, or anywhere else on your vessel where superior resistance to excessive wind force and high speeds is needed. Featuring brass and copper elements, this antenna can dramatically enhance the range of your marine VHF radio, so you’ll be able to communicate with other boats with ease. It also boasts a stainless steel ferrule with a 1”-14 thread. The gain on this antenna is 6dB and it offers a maximum output power of 100 watts. Bandwidth is 3 MHz within 2.0:1 VSWR and the coax supplies is 20 feet of RG-8/X. It DC grounded and has an impedance of 50 Ohms. The color of this antenna is black and it’s backed by a 5 year manufacturer warranty. Based on the reviews that we read, it seems like most of the customers who have used this marine VHF antenna are quite pleased with it. They noted that it is exceptionally durable and offers crisp transmission and an incredible amount of range. None! We couldn’t find any reason to complain about this marine VHF antenna, and none of the customer reviews that we could find were had anything negative to say, either. Final Verdict: The Shakespeare 5226-XT 8’ Galaxy Antenna is the best marine VHF antenna offered by Shakespeare. It is incredibly durable, can stand up to the highest winds, and offers incredible range and clarity. Shakespeare is such a reputable manufacturer of marine VHF antennas and their products are so high quality that we’ve included another option from them on our list: the 5010 Centennial White 8’ VHF Marine Antenna. This antenna is designed for use by boaters of all experience levels and ages. Featuring brass and copper elements and a brass ferrule that’s chrome-plated, complete with a standard 1 inch to 14 thread, this antenna is extremely durable and highly reliable; it can stand up to extremely high winds with ease. It also comes with a 15’ RG-58 cable, as well as a PL-259 connector, so you will have virtually everything you need to set it up and start using it; the only thing you’ll need is a mount (the mount styles that are recommended for this antenna include 4187, 4188-S, or 4190 ratchet mounts). 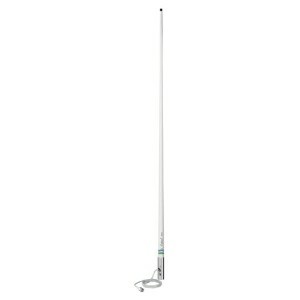 The color of this marina VHF antenna is white, so it offers a sleek look that will be sure to compliment your vessel. Final Verdict: If you’re on the market for an affordable, durable, reliable, and easy to use marine VHF antenna, the Shakespeare 51010 Centennial White 8’ VHF Marine Antenna is a fantastic choice. It is made of highly durable materials, it’s easy to install, and it drastically improves transmission on your marine VHF radio. 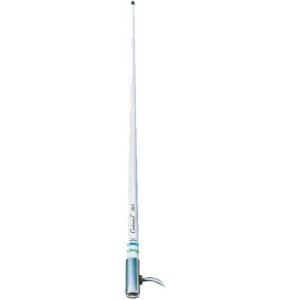 If you want to invest in a high-quality, durable marine VHF antenna, but you don’t want to spend a tremendous amount of money, the Tram 1607-HC 46-Inch VHF Marine Antenna is definitely an option that you should consider. This antenna is very affordably priced, and it’s also quite durable and incredibly easy to use. This marine VHF antenna is constructed of heavy-duty fiberglass, so it can stand up to all types of weather and strong winds, but It’s lightweight and won’t add drag to your boat. The stainless steel hardware further improves the durability of this antenna. You can easily attach a PL-259 connector; all you have to do is screw it off for small hole installation. With the included nylon ratchet mount, this marine VHF antenna can lay down with easy, which means that you will be able to maximize your reaction time. 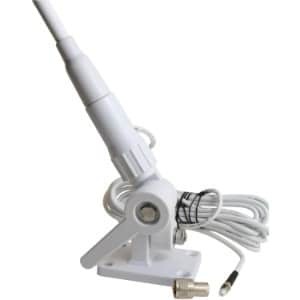 With a 3dBd gain, this antenna can pick up virtually all marine band frequencies; plus, it boasts a useful 20 foot RG-58 cable, which means that you can easily position it anywhere on your vessel. Based on the reviews that we read through, it appears as if most of the customers who have purchased and used this marine VHF antenna are quite pleased with it; they said that it is very easy to use, and that it’s durable and offers great reception. Final Verdict: The Tram 1607-HC 46-Inch VHF Marine Antenna is rugged, easy to install, covers all marine band frequencies, and is extremely affordable. The included 20 foot RG-58 cable allows for great flexibility, too. The fact that we’re featuring a third Shakespeare VHF antenna on our list really proves how high quality their products are. If you’re on the market for a short, yet highly durable and powerful VHF antenna, than this is the option for you. Standing at just four feet tall, this antenna is the perfect option for anyone who wants to pick up local signals that are created by vessels that are within close proximity to their own boat, or anyone who has a tall boat. You can easily fit under bridges with this antenna on mounted to your ship, and it will certainly stand up to inclement weather and high winds. While high performance antennas tend to pick up transmissions from boats that are far away, they can also reduce the transmission; however, that’s not the case with this marine VHF antenna. It offers extremely clear communication because it doesn’t pick up transmissions with far-off vessels that you don’t necessarily want to connect to. Though it doesn’t come with mounting hardware and it is a bit on the pricy side, we still think that it’s a fantastic marine VHF antenna. Final Verdict: The Shakespeare 5104 4’ Centennial VHF Antenna is a great choice for anyone who wants a shorter marine VHF antenna. It’s durably constructed, offers clear line of sight communication, and it can withstand high winds with ease. The last option on our list of the best marine VHF antennas is the TRAM 1600-HC 35 – Inch VHF Marine Antenna. If you’re looking for an antenna for your marine VHF radio that is rugged and offers an advanced design, than this is one that you should certainly consider. It’s very versatile and durable enough to mount onto virtually any part of your vessel. Made of heavy-duty fiberglass and reinforced with stainless steel, this antenna can stand up to high winds and rough seas with ease. In fact, the base on this antenna is so strong that if you chose to, you could actually mount it vertically! In addition to being durable, this antenna covers all marine band frequencies, so you should be able to receive whatever VHF channel you would like to with ease. Plus, if you’d like to tune into FM channels, all you have to do is invest in a splitter and you’ll be able to. This antenna is easy to mount, too. According to the reviews that we read, customers are quite impressed with this marine VHF antenna. They said that it’s very strong and that it offers great clarity. Final Verdict: The TRAM 1600-HC 35 – Inch VHF Marine Antenna is extremely durable, picks up all marine VHF channels, is very easy to install, and is quite durable; plus, the price tag is quite affordable. Just like any product you purchase, whether it’s a two-way radio, a two-way radio, a long range walkie talkie, a weather radio, a police scanner, a car GPS, or a shortwave radio, you’re going to want to make sure that you invest in the highest quality marine VHF antenna. The better the quality, the better reception your marine VHF radio will get and the longer it will last. To help you determine which marine VHF antenna will work for your needs, consider the following options listed below before you start shopping. Gain/dB rating. The gain/dB rating indicates how an antenna uses energy. Antennas that have a high rating can maximize transmission power through focus; however, the horizontal angle is minimized. Low gain/dB antennas offer a wide radiation pattern, which means that signals can get loss in choppy waters. Therefore, low gain/dB is ideal for sailboats, while high gain/dB is ideal for power boats. You want your antenna to stand up to the elements. The more durably constructed the device is, the better it sill be able to take on high winds and rain. The height. You also need to consider the height of the antenna. If you have a tall vessel and your antenna is too high, you could run into problems when you’re crossing under bridges, for example; however, if you want to get the broadest range possible, then a taller antenna is a better option. Ease of use. The best marine VHF antennas are easy to set up and mount. You want to be able to use your device without issues, so the easier t is to use, the better off you’ll be. 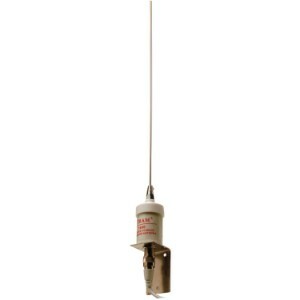 A marine VHF antenna is an absolute must for anyone who plans on using a marine VHF radio. All of the options listed in our review are very well made, highly durable, and offer clear reception.